Home » Posts » Attentionology for K-5 Teachers » Go from So-So to Super! Hi and welcome back to Attentionology of K – 5 Teachers! Parents need sitters; teachers need subs (substitute teachers)…on call to care for their children or students when circumstances require time away from home or school. 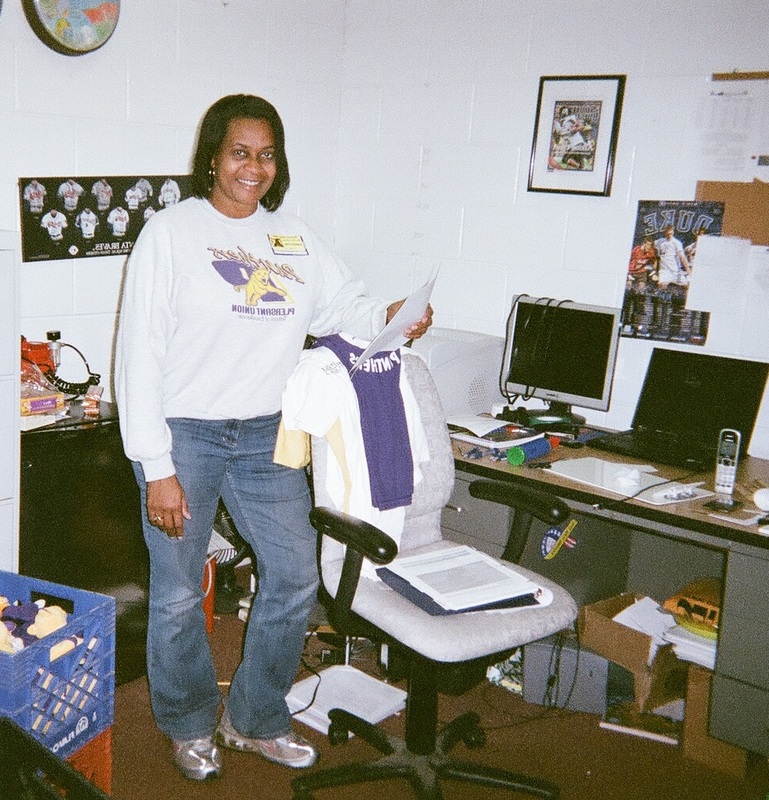 Meet Kim Hopkins, shown in my blog pic here. Kim subbed for the P.E. (physical education) teacher at a school where I recently taught. I asked Kim if she liked substitute teaching. I’ve noticed over time that the first words that “regular” staff members offer to school visitors, usually in a teacher’s lounge (a common meeting place), isn’t “Hello! What’s your name? Can I help you?” It’s “Who are you subbing for?” If I had a dollar for every time I’ve been first assumed to be a substitute teacher at schools where I’ve worked as a writer-in-residence, I’d be rich! Has your experience been like mine – subs sometimes seem to lack their own identity at school, at least in others’ eyes? This dilemma can make it difficult for subs to catch anyone’s attention, let alone go from so-so to super by exceeding expectations for their “performance” in class. Maybe some subs like life this way because “low-profile” does have some benefits; but maybe not. How can substitute teachers make on-the-job days go from so-so to super, benefiting not only themselves but also the students they reach and are charged to teach? Answer: Pack portable attentionology tools and tricks! 1) Rocks – Tuck a pack of small decorative landscaping rocks in your school bag (recommended for students in grades 3 – 5). When you first write your name on the board in the class where you’re subbing, tap the board with marker or chalk and tell the kids to remember your name. Announce that you have a surprise for “rock-solid” students – those who pay attention during study time – before the end of the day or period. Just before dismissal, walk around the room and pass out one decorative rock to each deserving kid. Tell each one that you appreciate his or her “rock-solid” school work with you. 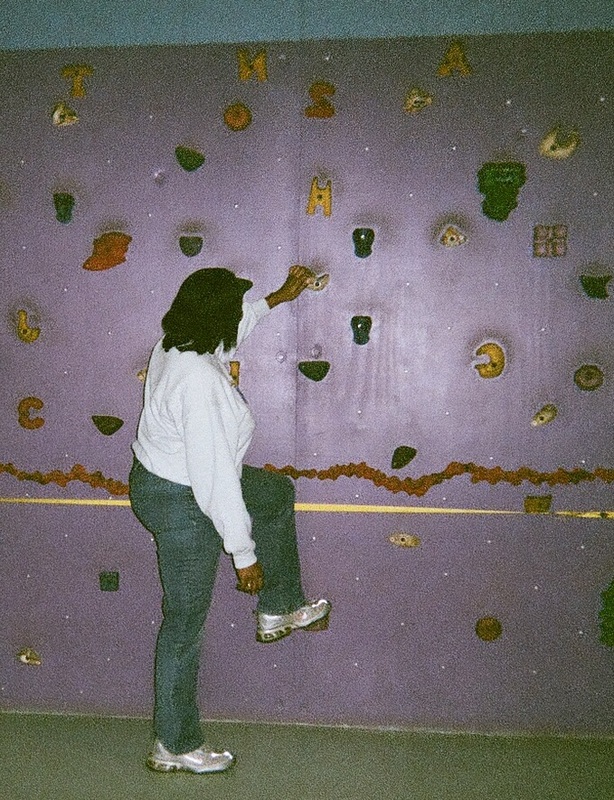 Kim Hopkins demonstrates rock climbing in a physical education class for kids. attentionology tool in her P.E. classes – a rock climbing wall (shown in my blog pic here). Safety rules and liability coverage in place, it would be awesome to have access to an eye-catching ready-to-climb wall in any instructional setting. help students develop critical thinking skills, figuring out the best climbing route. motivate children, using climbing time as a reward. Teachers can also use rock climbing walls that can be installed in instructional settings to inspire interest in exploration. Google rock climbing walls and mountain climbing for information and virtual travel sites. me doing in my blog pic here. Note how totally focused the class is on you. 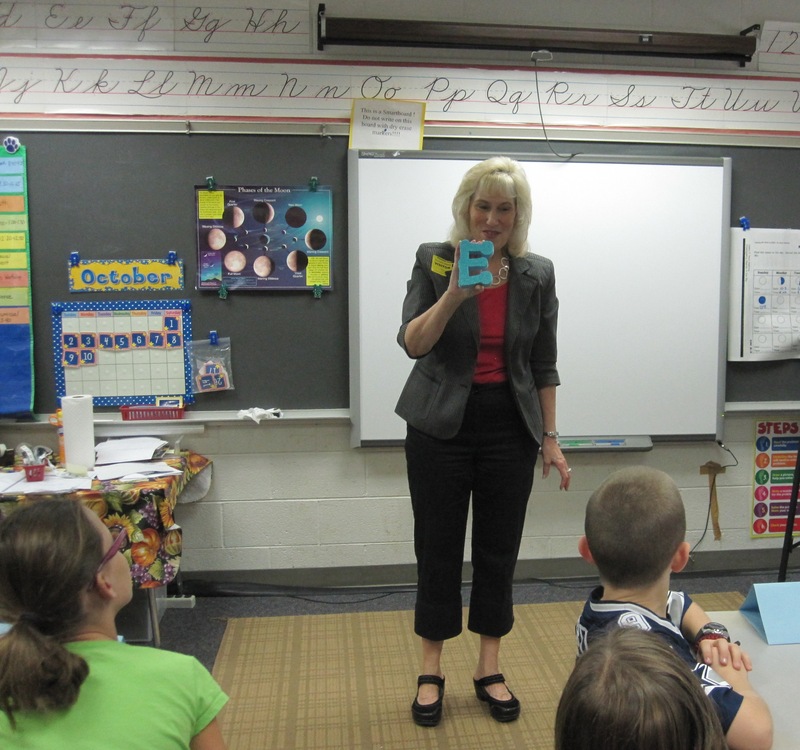 Close your “giant letter E presentation,” by announcing your expectations for the day, saying, “Please don’t think for a minute that because you have a substitute teacher for the day, effort is on vacation. I’m counting on good work so that I can give a good report to __________________” (the teacher you’re subbing for). 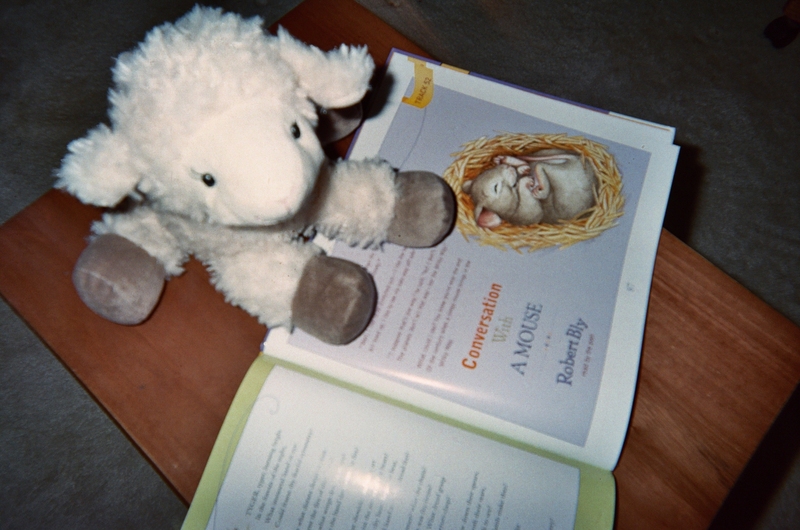 A little lamb can be a substitute teacher’s best friend! in a piece of fabric or inside a book for the early grades to take to school. Young children (grades pre – K – 2) especially love stuffed animals and puppets, and they’ll be delighted with you when you tell them that you’ve brought a “little animal friend” along for the time you’re going to be the class’ substitute teacher. It’s common knowledge that young children find security with familiar people, places and schedules in school. Having a substitute teacher breaks their regular pattern. Watch kids in early grades quickly warm up to you when you tell them that you’d really appreciate them helping your “friend, Sunshine,” feel comfortable in class by speaking nicely to the little animal when it “wakes up” from its nap. Score more classroom management success with this trick. Young kids will gladly keep their voices down if a little animal is “sleeping” nearby, pretend or not. Bottom line…of course subs need to follow the guidelines spelled out by the teachers that have hired them, but there’s no rule saying that substitute teachers can’t bring their own strategies to school. Subs can enrich class time for themselves and their students by using portable attentionology tools and tricks to make school days go from so-so to super! 2 Pings/Trackbacks for "Go from So-So to Super!"